SN2-type reactions are fundamentally simple and ubiquitous processes which are important in physical organic chemistry and biological systems. The factors affecting the rate of the SN2-type reactions have attracted long-standing attention as it is of critical importance in practical applications. It is well known in the literature that the substituent effects, leaving group (LG) ability effects, nucleophilicity (Nu) effects, steric effects, and solvent effects are typical factors to control the SN2-type reaction. Exploring the new factors affecting the SN2-type reactions should provide helpful information for their efficient utilization. Recently, a DFT study by Ke et al. predicted a new factor to control the SN2-Type organometallic reactions, i.e., the hetero-aggregation effect of simple metal-salts. Inspired by previous works indicating that the homo-aggregation of reagent itself may affect the reaction rate of Simmons-Smith cyclopropanation reactions, Ke and coworkers studied the influences of hetero-aggregation of simple metal salts on this SN2-type cyclopropanation reactions. DFT calculations revealed a significant enhancement of the cyclopropanation reaction by hetero-aggregated lithium carbenoids (LiF)nLiCH2F. When n increased from 0 to 7 due to the hetero-aggregation effect, the reaction constant ratio kn/k0 could increase from 8 to 2.0×103, 2.3×103, 4.9×104, and 1.9×105, for n = 1 to 2, 3, 5, and 7, respectively. 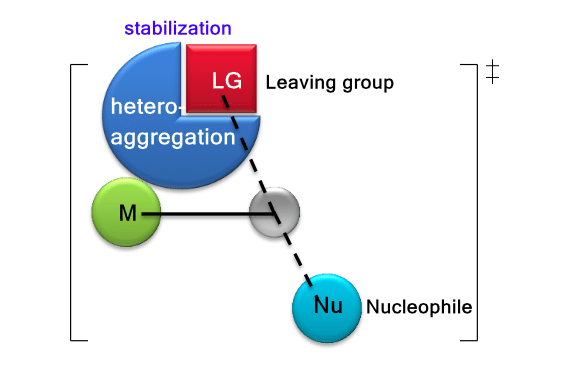 Moreover, the promotion by hetero-aggregation is comparable to that of homo-aggregation (LiCH2F)n. The origin of the significant enhancement of reaction rate could attribute to the novel structural character of the hetero-aggregation systems, i.e., the leaving halide is stabilized by multi-lithium cations in the hetero-aggregated (LiF)nLiCH2F species. In order to reveal whether it is a common reactivity pattern for hetero-aggregated lithium carbenoids, the lithium carbenoids LiCH2OH, which have a low tendency for cyclopropanation, were taken into consideration as well. The predicted rate constant ratio k′n/k′0 for (LiF)nLiCH2OH could increase from 68 to 4.6×103, 9.0×103, 2.5×104, and 6.8×104, for n = 1 to 2, 3, 5, and 7, respectively. 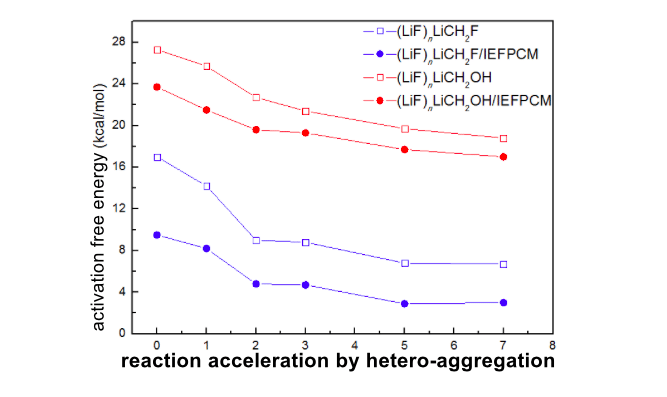 It is obvious that the rate of cyclopropanation reactions can also be dramatically enhanced by the hetero-aggregation of LiCH2OH with (LiF)n.
Based on these calculation results, it is reasonable to propose the concept of SN2 reactions acceleration by employing hetero-aggregation with other economical and convenient compounds. As a common reactivity pattern, this hetero-aggregation strategy may also be extended to other types of carbenoid reagents, such as aluminum carbenoids, zinc carbenoids, and samarium carbenoids. This theoretical insight into the newly-proposed controlling factor should conduce to our knowledge of SN2 type reactions, which should provide useful hits for developing new strategies to facilitate organic reactions and synthesis with extra additives. Moreover, as a new factor to control SN2-type reactions, hetero-aggregation with other economical and convenient compounds can be utilized as a potential method to enhance efficiency for a wide range of organometallic reactions with a leaving group in the transition state. 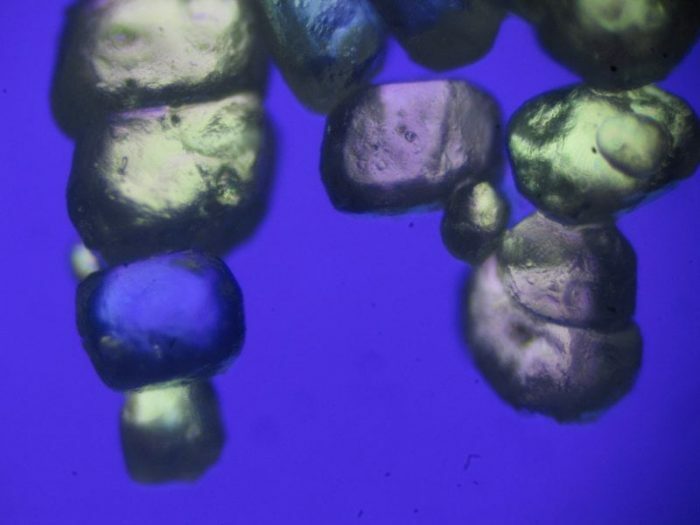 One may envision that the hetero-aggregation with simple metal salts and their potential applications for reaction acceleration may be significantly intriguing. Also, the tendency and physiochemical properties of hetero-aggregation between different types of metal salts and organometallic reagents in solution are interesting and challenging issues for both experimental and theoretical studies in the future. These results are described in the article entitled Making more efficient lithium carbenoid reagents for cyclopropanation by hetero-aggregation: A DFT prediction on a new factor to control the SN2-Type organometallic reaction, recently published in the Journal of Organometallic Chemistry. This work was conducted by Prof. Zhuofeng Ke from Sun Yat-sen University. Zhoufeng Ke is an Associate Professor at Sun Yat-sen University School of Material Sciences and Engineering.